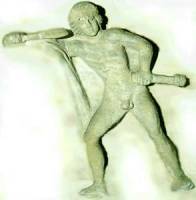 "As you yourselves have often certainly experienced, a warrior especially needs these three things--he must guard his person with strength, shrewdness and care; he must be free in his movements, and he must be quick to draw his sword." NOTE: Japanese martial arts are very diverse, and so any generalising statement or rule will have exeptions, probably about 50% of the cases. None of the following should be taken as absolute truth. Iai is an art, or perhaps training method, using a real (or almost real) sword in solo practice. Katas start and end with sheathed sword, and hence involve the drawing and sheathing of the sword. Iaido is most often translated as the way of harmonious living, the art of adapting to circumstance, or the way of being here and now. The name consists of iru (being), ai (harmony), and do (path). 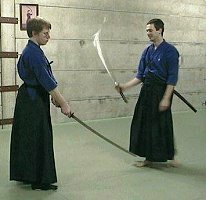 In iaido, the practitioner battles non-material opponents with techniques that today are completely obsolete and devoid of any practical application, and do not even offer the satisfaction of affirming technical superiority over other practitioners through competitive encounters. As a true Budo, iaido is a battle with the self, a cutting away of all redundancies. Trough the precise and immutable movements of the kata, the practitioner seeks to mobilise his entire being, to unite the intention, the action, and the sword, every detail being vital, a matter of life and death. Through this unification of sense, will, and action, the sword becomes a tool for spiritual development (seishin tanren). For this reason, more and more budoka turn to the austere practice of iaido. Most traditional sword schools primarily use partner practice with wooden swords as training method, and solo practice with the sword (which may or may not be referred to as iai) is usually a minor part of the curriculum. Iaido as an art that focusses on iai as its major component, is usually attributed to Hayashizaki Jinsuke Shigenobu (1542-1621). 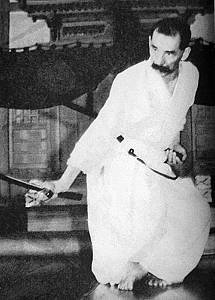 Little is known about him, but his supposed students originated most of the Iaido styles practiced today. 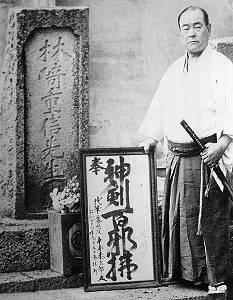 While many consider Hayashizaki as the father of Iaido, it is nevertheless mistaken to attribute the invention of Iai to him. The Tenshin Shoden Katori Shinto ryu (1447) for example predates him by about a century, and its curriculum contains several iai sets. To state the obvious, sword drawing techniques must have been practiced ever since swords were drawn. Already in Kormac's saga, a millenium before Hayashizaki, Skeggi gives extensive instructions to Kormac on how to draw his sword Sköfnung (Kormac ignores the advice and damages the ancient sword). 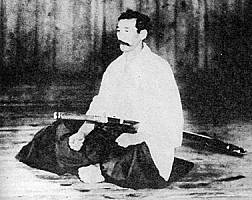 Hayashizaki may have been the first to emphasise the potential mental and spiritual benefits of Iaido training. One of his best-known students was Tamiya Heibei Narimasu (founder of Tamiya ryu). The style we practice (at Sakura Ternat) is Muso Shinden Ryu, which is actually a collection of several rather accidentally related koryu styles with a geneaology that could give anyone a headache. The official lineage traces back to Hayashizaki's Shimmei Muso ryu, but the majority of the enclosed ryu have quite different origins. The earlier part of the geneaology is also shared with many other styles. In the 20th century the masters Oe Masamichi Shikei (1852-1927) and Nakayama Hakudo Hiromichi (1869-1958) significantly reorganised and modified the curriculum, and presented the collection of three ryu of the tradition as just one style, calling one ryu 'basic techniques', another 'intermediate', and the third one 'advanced'. The Shoden or basic style is based on Omori ryu, founded by Omori Rokurosaemon Masamitsu. Omori was a swordman of the Yagyu Shinkage ryu (Bishu style) founded by Kamiizumi Ise no Kami Fujiwara Nobutsuna (or Hidetsuna), himself a student of Kage ryu, Tenshin Shoden Katori Shinto ryu, Kashima Shinto ryu, and heavily influenced by Zen master Takuan (1573-1645). Omori had also studied under Hasegawa Chikaranosuke Eishin Hidenobu but was thrown out over a personal conflict. Omori combined the kata of Yagyu Shinkage ryu with Osagawara ryu reishiki of which he was also a student. Omori taught his style together with Shinkage ryu to Hayashi Rokudayu Morimasa (1661-1732) and to Oguro Motoemon Kiyokatsu, both headmasters following Hasegawa Chikaranosuke Eishin Hidenobu in what was then called Muso Jikiden Eishin ryu. They continued teaching the Omori ryu together with the other styles then contained in this ryu. In the 20th century an extra kata was added to Omori ryu, the names and order were changed, and the ryu was dumbed down a bit to fit its new role as beginner's fare. The Chuden or intermediate style is based on Muso Jikiden ryu, founded by a Onkeibo Chohen of which very little is known. Izasa Ienao (1486-1588), founder of Tenshin Shoden Katori Shinto ryu, is said to have been 7th headmaster of this school. The 19th headmaster, Hasegawa Chikaranosuke Eishin Hidenobu, was also 7th headmaster of Hayashizaki's Shimmei Muso ryu. 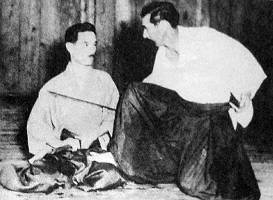 He taught both styles under the name of Muso Jikiden Eishin ryu or Hasegawa Eishin ryu. 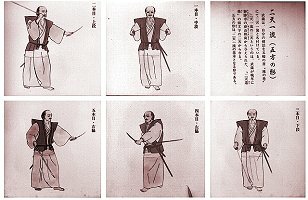 The Okuden techniques are the oldest (if we disregard the mythical foundation of Muso Jikiden ryu), and attributed to Hayashizaki Jinsuke Shigenobu, who called his style Shimmei Muso ryu. The Okuden consists of a suwariwaza set and a tachiwaza set. This part of the lineage crosses many other styles said to derive from Hayashizaki. Tamiya ryu founder Tamiya Heibei Shigemasu was also 2nd headmaster of Shimmei Muso ryu (how anyone managed to pass on 2 styles is left as exercise to the reader), and from his teaching derive also the Shin Tamiya ryu, Jikyo ryu and Mugai ryu (the latter two having merged later). The third headmaster, Nagano Muraku was student of both Hayashizaki and Tamiya, and he passed on Shimmei Muso ryu as well as developing his own Muraku ryu, while one of his students, Ichinomiya Sadayu Terunobu, who was also a student of Hayashizaki, founded his own Ichinomiya ryu. It is virtually impossible to determine how much resemblance the current Okuden waza have to whatever it was Jinsuke Shigenobu developed. At the death of Oguro Motoemon Kiyokatsu the ryu split into two branch school, the Tanimura ha and the Shimomura ha. The Tanimura ha is still known today as Muso Jikiden Eishin ryu, while the Shimomura ha was renamed to Muso Shinden ryu by the 16th headmaster, Nakayama Hakudo. Therefore he is often named as the "founder" of Muso Shinden ryu. Actually it was only after his death that his followers started to formally use this name for Hakudo's particular style. Nakayama Hakudo was trained in both Tanimura and Shimomura ha (which at the time included Muraku ryu, or at least Hakudo is said to have learned this from Hosokawa Yoshimasa), as well as Yamaguchi Itto ryu and Shindo Munen ryu (another derivative of Shinkage ryu). Oe Masamichi, 17th headmaster of Tanimura ha, fixed the name of the Tanimura ha at Muso Jikiden Eishin ryu and made many changes. He dropped 2 of the 13 okuden tachiwaza and these are no longer practiced. Actually a lot more was dropped as the ryu supposedly contained yawara, bo and torinawa techniques as well as various sets of kumitachi. New techniques were added such as hayanuki and bangai. Like Hakudo, Oe practiced both Tanimura and Shimomura ha and is sometimes named as the 15th headmaster of Shimomura ha. 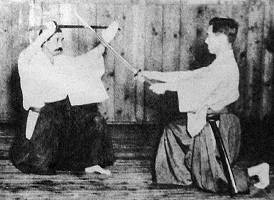 In the 20th century the Zen Nihon Kendo Renmei created a set of iaido katas, known as the seitei gata (standard forms). The purpose was probably to encourage Kendo practitioners to experience the handling of a real sword. Whether this was effective, or whether kendo has influenced the seitei gata to a greater extent than vice versa, is debatable. Not all kendoka practice Iaido, and many iaidoka don't practice Kendo. The Zen Nihon Kendo Renmei also created the Kendo no kata, a set of partner forms using wooden swords, which are required for kendo promotion (although whether this is observed in practice is also debatable). The ZNKR seitei gata are practiced so Iaidoka can obtain ZNKR-recognized grades. They also make competition possible. Again this is debatable, since advanced practitioners are not only allowed, but actually required to include non-seitei ("koryu") katas in grading tests or matches. The "standard" seitei gata also change a bit each year (though some may argue the changes aren't really changes). Many Iaido practitioners, especially those not involved with Kendo, would rather be affiliated with an actual ryu and obtain ryu gradings instead of dealing with the seitei gata. Unfortunately opportunities to do so are scarce. 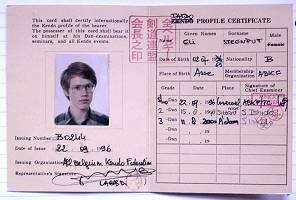 The most practiced ryu in Belgium is Muso Shinden ryu, which was founded in the 20th century, and whose current succession is unclear, if not non-existant. Muso Jikiden Eishin ryu and Tamiya ryu for example at least have a headmaster, but you have to go to Japan to train with them. 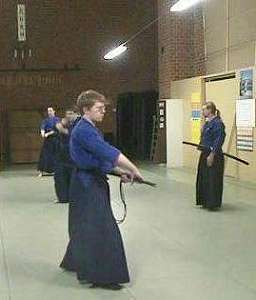 The seitei gata have the advantage that they form a decent introduction to iaido that can be learned from any iaido teacher, almost anywhere, with little variation. One can't fully understand the sword by solo practice exclusively. Muso Shinden ryu contains two (or more, according to whom you ask) sets of partner forms, the tachi uchi no kurai (standing forms) and the tsumi ai no kurai (seated forms), However, these are not very widely practiced, and there is even some doubt on their authenticity, given the important differences with the iai part of the ryu. There were supposedly many more sets contained in the ryu, supposedly including a now supposedly lost jujutsu component. Another related practice is iai giri or tameshi giri, cutting objects (mostly inanimate) to improve cutting technique. And one can of course spar with bamboo sticks in Kendo. The majority of practitioners in Sakura Ternat didn't start Iaido as their first art. We have aikidokas, jujutsukas, karatekas and even Tai Chi sword practitioners. The ZNKR doesn't grade children under 14, but we have members that started younger and we don't employ a fixed minimum age (applicants are considered case by case). 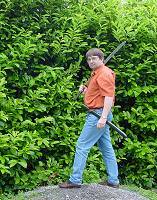 Iaido is very often misunderstood, even by experienced practitioners of other martial arts. Quite often it is interpreted as a kind of sterile sword dance, a "moving meditation" somewhat like Tai Chi but much slower, in which practitioners numbly perform the same 4 movements (nukitsuke, kiritsuke, chiburi, noto) over and over like a kind of physical mantra, until they are overcome by terminal boredom. Even people who think they have a pretty good idea what Iaido is about, are surprised to hear there exist other katas besides ZNKR seitei mae. While the term "meditation" is often associated with the practice of Iaido, I think it is an unfortunate choice of words; "intense focus" or "concentration" are probably much more appropriate. 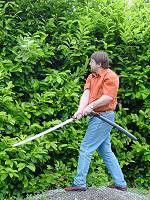 Iaido practitioners obviously don�t train with the aim of becoming proficient swordfighters. Rather, gaining skill with the sword is the means by which the practitioners achieve their purpose. Thus, while the ultimate aim of Iaido is not how to learn to kill with a sword, during practice the practitioner is totally focussed on eliminating the imaginary opponent as efficiently as possible within the parameters of the kata. The mental plane in Iaido is undoubtedly where most of the action takes place, yet the apparent simplicity of the physical movements is extremely deceptive. Remember that the simplest things are always the hardest. You may have heard that Iaido consists of solo training. This may be slightly misleading. In a typical class, there will be times you might wish you were alone. You are constantly watched, and told in no uncertain terms about all the things you are doing wrong, that your feet are positioned incorrectly, that you are looking in the wrong direction and completely missed the enemy with your cut, that you are going to lose your balance in the next five seconds, and that additionally you should concentrate on your opponent and not let yourself be distracted by being verbally torn apart, ... In less than 10 minutes of this "moving meditation" your clothes are drenched with perspiration and you are out of breath. Casual observers are often confused by the many moments where nothing seems to happen and the swordsperson is apparently taking a little break. People seem to expect a wild rush of activity, swords being torn out of their scabbards and opponents cut down as fast as the laws of physics permit, maybe followed by some flashy twirls as seen on Highlander. Iaido practitioners, however, try to anticipate the opponent and time their actions correctly, so that no rush is needed. Correct technique and spirit is much more important than speed. Also, when speed is eventually attained, it is generally not by moving faster, but by moving less, eliminating what is superfluous. And, as Ishido Shizufumi sensei says: "if you are so very fast, you should rather be running away." performing kata while an assistant attempts to distract you or make you laugh. Iaido is a primarily mental activity, demanding extreme focus, control, and alertness. None of which is readily apparent to the uninitiated. Sakura Ternat trains weekly in the ZNKR seitei gata. Katas from Muso Shinden ryu are practiced depending on class composition. Those who wish to participate in partner practice with wooden swords, can join the training in techniques from Hyoho Niten Ichi ryu, with long, short and two swords. ZNKR Jodo training is also available and highly recommended as "contact" weapons training. Attending seminars is considered very important in Sakura Ternat. Practitioners are encouraged to attend as many seminars as they can. Besides the extra training, this allows the practitioners to compare what they learn from us with the styles from other teachers. All ZNKR grading tests from first kyu and up are taken either before the ABKF national grading commitee, or during an international seminar like the Nakakura cup or the Ishido summer seminar. Currently grades below first kyu are internal "club grades" and not obligatory. Sakura Ternat has never used the kyu grading system. We employ a system of three levels called jo, ha and kyu (not related to the Tatsumi ryu system which uses the same level names) with kyu being the level where people are considered ready to try their first kyu grading test. Fairly recently, Iaido competition has been imported to Europe. In Iaido competition, two competitors perform several katas side by side. A jury compares the performance and declares a winner. (shiaijo field layout) Obviously the attraction of such competition is rather limited. While in kendo competition for example, you can look forward to meeting exciting new opponents, only the most attention-craving iaidoka consider travelling to a big international taikai worthwhile, since what you get to do in iai competition is not qualitatively different from what you can do in your own dojo: there is no meaningful interaction with the opponent. This competitive aspect has been strongly pushed during the last couple of years. At first it was presented as somewhat of a joke, then it was to help the higher ranks in polishing their shinpan skills, later still people were coerced into participating by organising the competition between grading test and the announcement of grading results, and currently we have situations such as teams of high-ranking sensei coming over for three days of flag-waving, and special training seminars reserved for 'national teams'. Naturally, these developments are not universally appreciated. Beginners should consult with their teacher before purchasing equipment. Iaido is not very well known, and we know of martial arts stores selling totally unsuitable equiment to uninformed beginners. Equipment can be borrowed during the first stages of your training. An important piece of equipment for the beginner is the obi or belt. 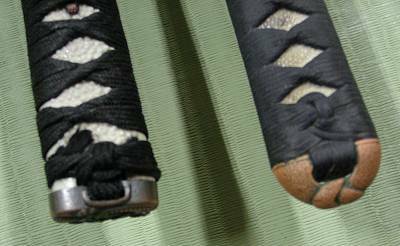 The Iaido obi is very different from the usual karate or judo belt, because it must securely support the sword. It must be at least 6cm wide, and must be long enough to pass three times around the body and make a proper knot. The color of the belt is unimportant, Iaido doesn't use external marks of grade (but no fluo colors please). The uniform consists of a jacket and a hakama. The jacket should be of the Kendo or Kyudo model, with short sleeves and a split in the back instead of on the sides. Trousers (zubon) are not worn under the hakama, so the jacket must be long enough to decently cover the upper legs (and again, not have splits at the sides!). A wooden sword can be had cheaply for around 10 euro. This will eventually break or shatter, and will have to be converted to a tanto or something similar. For jodo practice a higher quality bokuto is recommended. Hyoho practice requires a special type of wooden swords, which cost around 6500yen for a daisho pair. For seminars, a pair of kneepads is recommended (these should allow one to sit in seiza-consult your teacher first). Your major, and most expensive training tool is of course your sword. Talk to your teacher first! Bring your teacher along to the store! We have learned from experience that, for example, martial supply store owners or publicity material are not a reliable source of information to assist beginners in their purchase. We had enthusiastic beginners turn up with wallhanger swords on their second class, because they relied on the store owners. If you buy a sword before you join a school, your instructor may have the unpleasant duty to inform you that your replica is unsafe for practice and can't be allowed in the school. Most replica swords sold in martial arts stores are fine to hang on the wall as something that vaguely resembles a Japanese sword from a few meters away. It will fall apart within 6 months when used for training (besides being heavy, unsafe, poorly balanced and not being available in different lengths). Some of these are even unsuitably shaped for use, for example, I once saw a replica sold as 'iaito' that looked suspiciously like a 'UC gold katana' where the kurigata was placed so far from the koiguchi that a proper sayabiki was impossible with it. Remember that worthless replicas can be 'made in Japan' too. 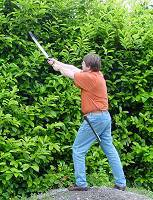 A shinken (sharp Japanese sword) is generally not recommended for beginners. A real Japanese sword is usually both dangerous and valuable, a combination that doesn't really rhyme with beginner. You can get a very basic iaito for around 18.000 yen on a Tozando special sale, anything cheaper is almost certainly junk. But a well-constructed iaito will serve you many years and perhaps more importantly, if you want to quit or (hopefully) want to upgrade to a more fancy sword later, you can sell it to a new beginner with a clear conscience. The following pictures compare a quality Nosyu iaito (approx. 6 years in use) with a "wallhanger" (used approx. 6 months). It is our hope that this may give the novice buyer some hints on what to look for. The tsuka is by far the most important part of an iaito as it forms the main connection to the user. The quality tsuka on the right is wood, covered with genuine samekawa (ray-skin), and tightly wrapped. While a bit smudgy from much use it shows absolutely no signs of loosening. The tsuka-kashira is solid copper. The tsuka on the left is solid shiny plastic. Despite generous applications of superglue the loosely wrapped ribbon became undone after a few months of training. The kashira is a bit of stamped metal. By imagining lines connecting the corners of the "diamonds" in the handle wrap, you can get an idea of the amount of care applied by the respective craftspersons. 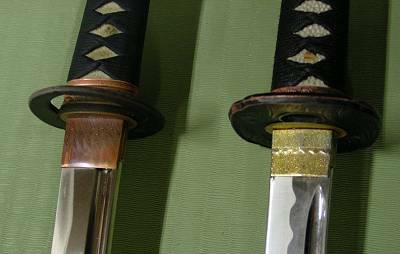 A real habaki as on the left is a little work of art and fits the sword snugly. The wallhanger betrays itself by using cheap metal and finish. Note also the casting seam on the rim of the tsuba of the wallhanger on the right. 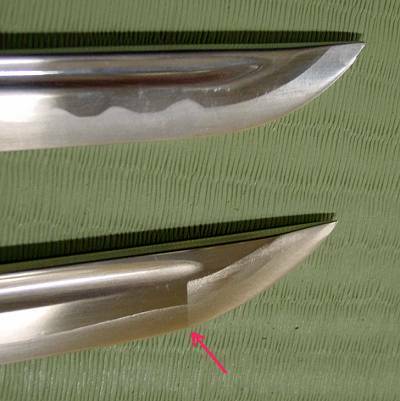 All wallhanger-type swords I have seen omit the line separating the kissaki from the rest of the edge (yokote). 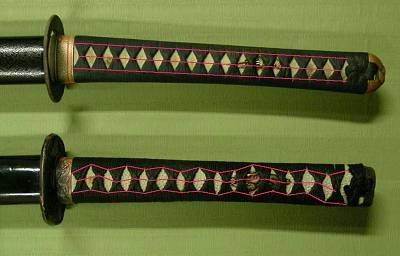 Some types of Japanese swords did not have this feature, but quality iaito seem to usually have it. Most wallhangers such as the one at the top of this picture have a stainless steel blade, whereas real iaito are *never* from stainless steel. The iaito blade is instead an alloy usually involving aluminium, zinc, copper and other non-ferrous metals. Sakura Ternat offers a dual fee structure. The annual class fee is 36 euro, which includes insurance and invitation to the yearly "general assemby." The second year's fee is reduced according to the number of months trained in the first year. Beginners get a free month of training. We are pretty confident that after a month of regular training you will know whether you could stand to stay with us or not. Serious practitioners will pay an additional 24 euro yearly, which includes registration with the All Belgium Kendo Federation. 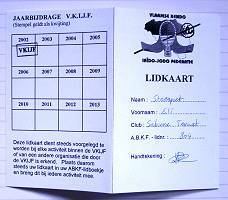 This registration allows students to participate in gradings and seminars. This is generally not encouraged for children under 14 (since they can't grade anyway) or beginners with very irregular training attendance or who don't want to attend seminars. Sakura Ternat provides our own insurance (which also covers beginners not yet registered) since we are not entirely satisfied with the arrangement offered through the ABKF (though this is included automatically with your ABKF registration). This registraton covers all disciplines of the federation including jodo and kendo. Find out more at the Sakura Ternat site.